As we head into the seventh month of the Catherine's Garden BOM - celebrate being past the half way point! Month Seven is HERE. I sometimes run out of steam at the borders. Providing the border patterns half way through gives you a chance to work on it a little at a time. My approach was to do a leaf a day. I treated myself to stitching a border center flower as I completed a section of leaves. 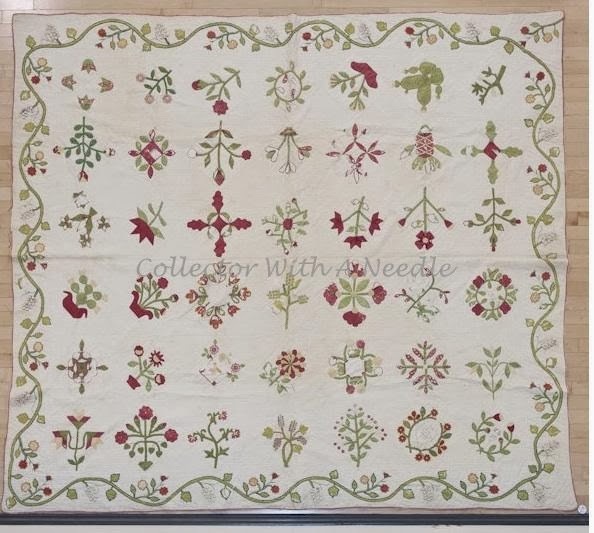 The corners are appliquéd after the borders are on the quilt. The design covers the seams. The red vine tails will be lined up and trimmed and it will be time to layer and quilt. You can read more about the antique quilt HERE. Waiting to start - there's a stack of quilts under that sheet! 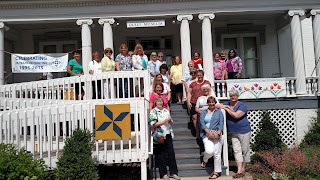 I just returned from a wonderful trip to Warrenton, Virginia - located in Fauquier county. 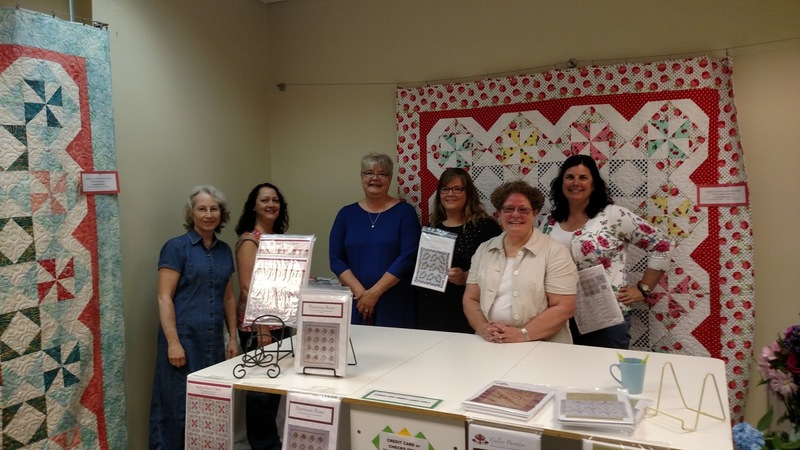 A special Thank you to Kelly Ann's Quilting who sponsored the event and my lecture. This is beautiful country - wine and horse acreages abound. A short drive from Washington DC makes it a great place to vacation and shop. Did I mention I posted a box home...with all kinds of goodies! My lecture was held at the visitors center to accommodate a large group of people. This is enthusiastic quilt country! 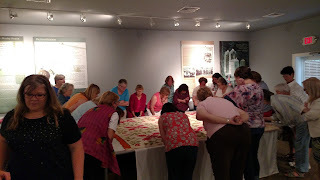 I was able to set up the presentation 'in the round' and attendees were able to get up close with each quilt. 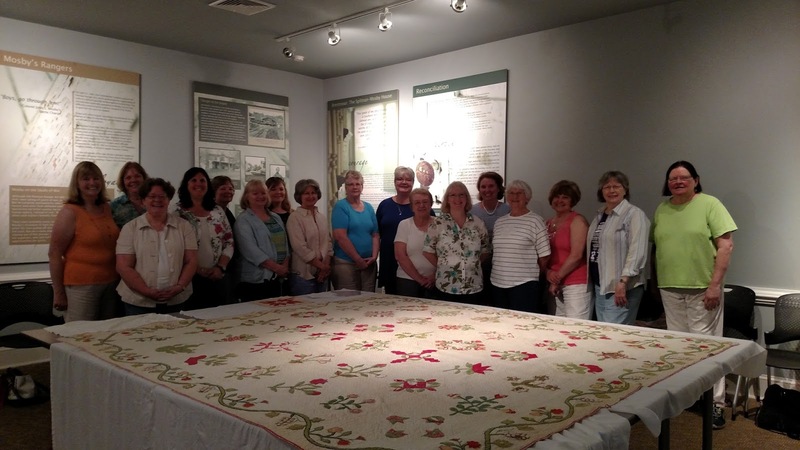 One of my goals was to enable Doreen's Noah and Matilda students to have their picture taken with the original antique quilt. I think Matilda would be happy too. They are a wonderful, gracious, talented group of stitches and I am honored to have spent time with them. We all agreed we could have stayed for hours talking quilts! 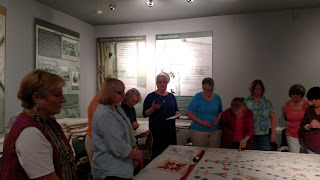 They enjoyed the information and I enjoyed hearing their reactions as each quilt was revealed. They loved surprises like Karen's (Log Cabin Quilter) wool Radical Rose. Sticking to the plan we ended almost on time - and made the short jaunt over the Kelly Ann's Quilt Shop. At the shop I had the rewarding opportunity to visit with several attendees and sign pattern covers. Some of the stitchers brought their projects to share with me. So inspiring to see their work!! These girls STITCH! I wish I had taken pictures of their work. You can see some examples HERE. It was also fantastic to spend time with Maureen (Pursuit of Quilts). After the Day 1 events, we shared good food and Virginia wine - with more quilt talk! Day 2 was a bus trip to The Virginia Quilt Museum to see three exhibits: Celebrate The Day, A Virginia Tribute to Jane Stickle and Civil War Quilts: Antebellum to Reunion. 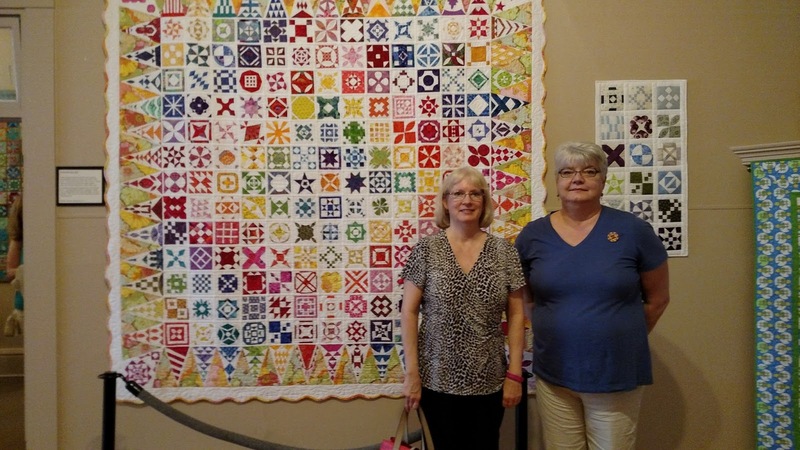 160 of Doreen's students have completed Dear Jane quilts! I'd visited the museum before, and had high expectations. It blew me away!! Doreen (Aunt Reen's Place) is the curator of the "Virginia Tribute to Jane Stickle" exhibit. 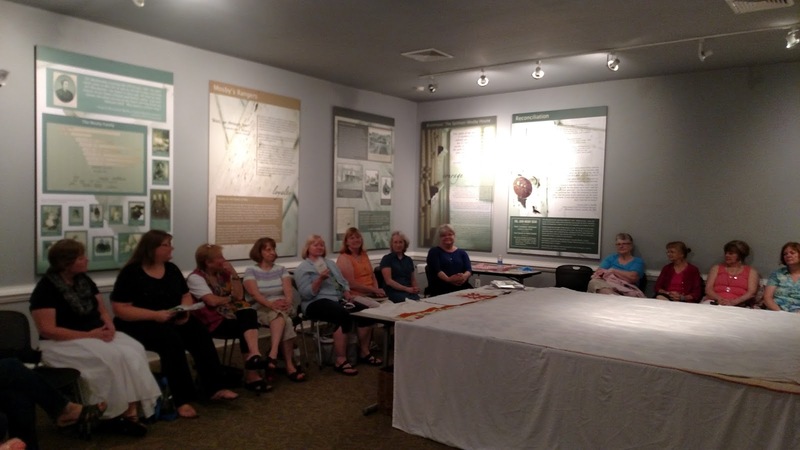 She did a gallery talk for us, providing the story of each quilt. 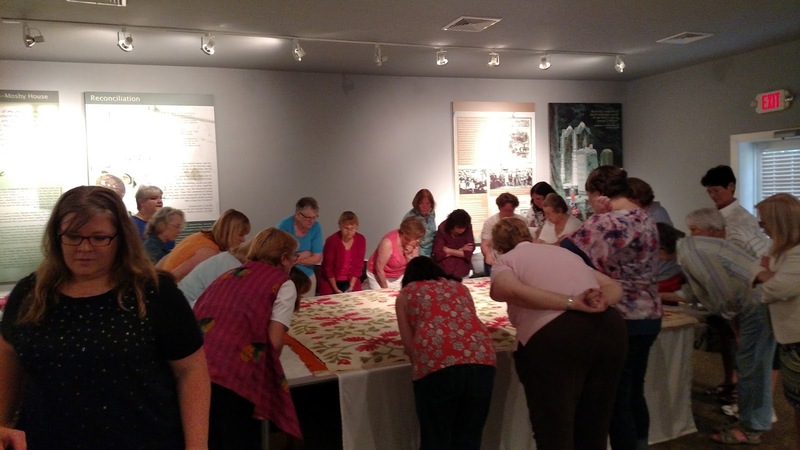 Her curatorial eye was evident in the variety of quilts and stories presented. From 2" blocks to creative settings - each example was a work of art. Sorry, photos were not allowed. More shopping, good company, food and wine wrapped up the day. I am still savoring every wonderful moment! You can read more about the event on Doreen's blog (Aunt Reen's Place) HERE. Have Quilts - Will Travel is my new motto! 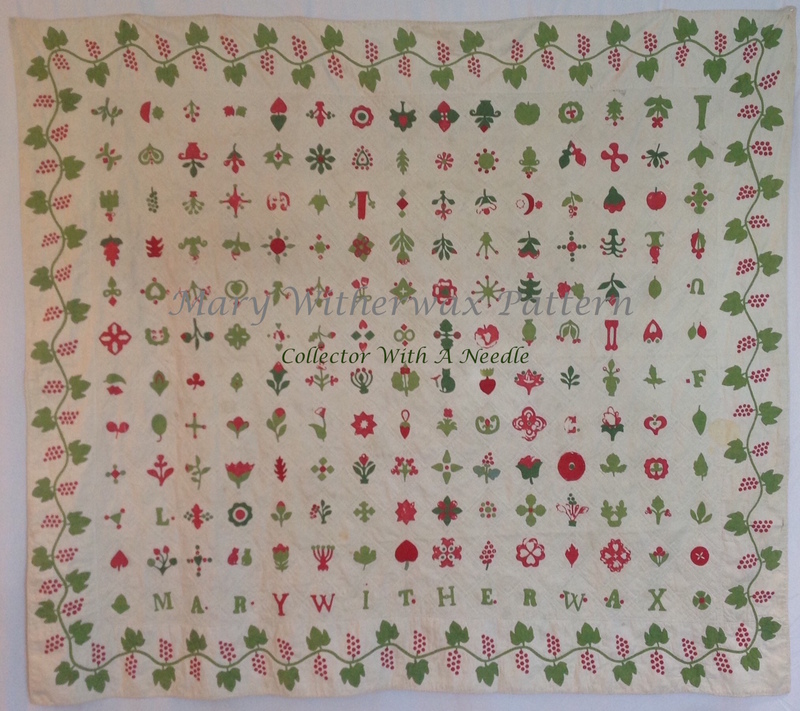 I first saw this string quilt in 2012. It was a presentation at the Brass Armadillo Antique Mall. Little did I know this quilt had a future story for me. I like the layout, rather dark indigo setting and the unusual eccentric print around the stars. I wasn't sure I would ever see the quilt again. It was added to the mental bucket list of wouldn't it be a good one to recreate? Fast forward a year and Jeananne, the owner became my quilt appraiser and friend. She has so many fantastic quilts in her collection - this one just kept 'speaking' to me - the way quilts do. One very cold and snowy day this winter we decided it was time to recreate the quilt. We did some measuring and penciled up our pattern, dug into our stash - and worked up our first stars. Each diamond in the star averages about 9 pieces of fabric like the original. I learned that string piecing takes longer than I had estimated - but I enjoyed the flexibility. One of the many things I like about the antique is the backing - home dyed, butted whip stitch seam with selvages in tact. We dyed our backing fabric - trying to keep it splotchy. I hand whip stitched my backing seam and left the selvages on. We did have them machine quilted - as much as I LOVE the hand quilting on this one - I also wanted it done to use and enjoy NOW. 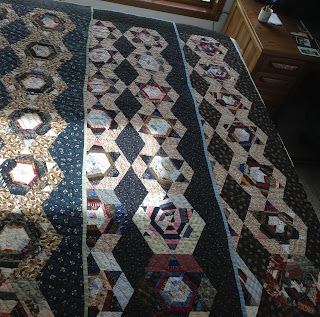 Here are the three quilts together. Mine is in the center. 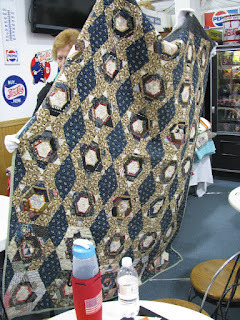 Jeananne's quilt is on the bottom, she used 20% period/vintage fabric in the strings. Jeananne purchased the c. 1890 original in Franklin Tennessee. 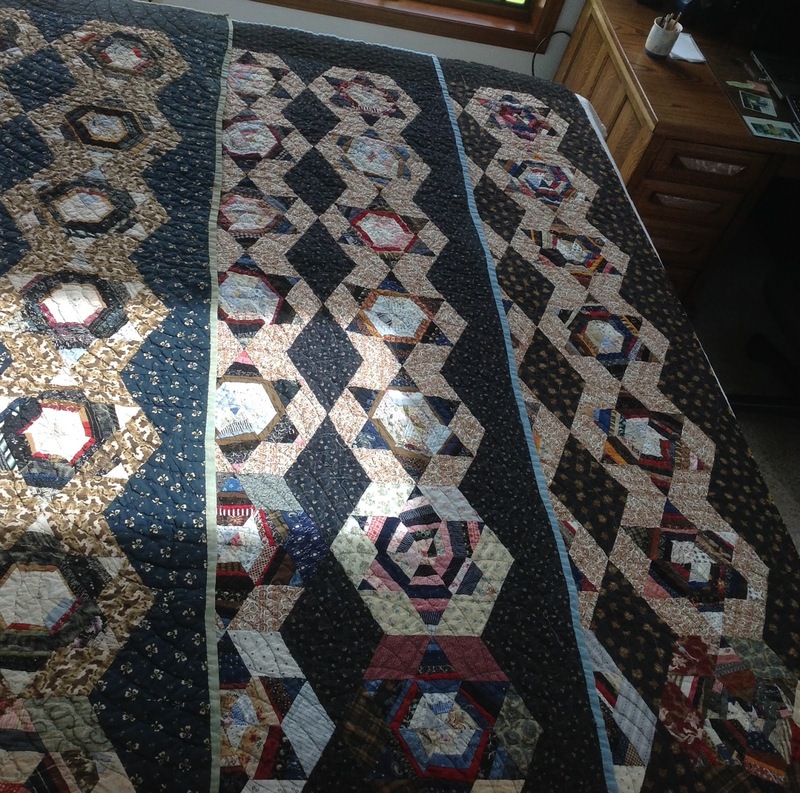 It measures 58" x 75"
Back to front binding, hand quilted fans. This is Jeananne's completed quilt. Note the lower two rows are very scrappy setting diamonds - like the original. She has more vintage/antique fabrics used in hers. This is my Frankin Star - fun memories. Back to front 1" binding, hand stitched down. I think my long arm quilter Jewel, was less than impressed. As she had it ready to quilt she contacted me and asked if maybe I forgot the border - - or something it wasn't quite right. I assured her it was OK. I thanked her for her diligent concern, and explained it was intended to be just like the circa 1890 original. 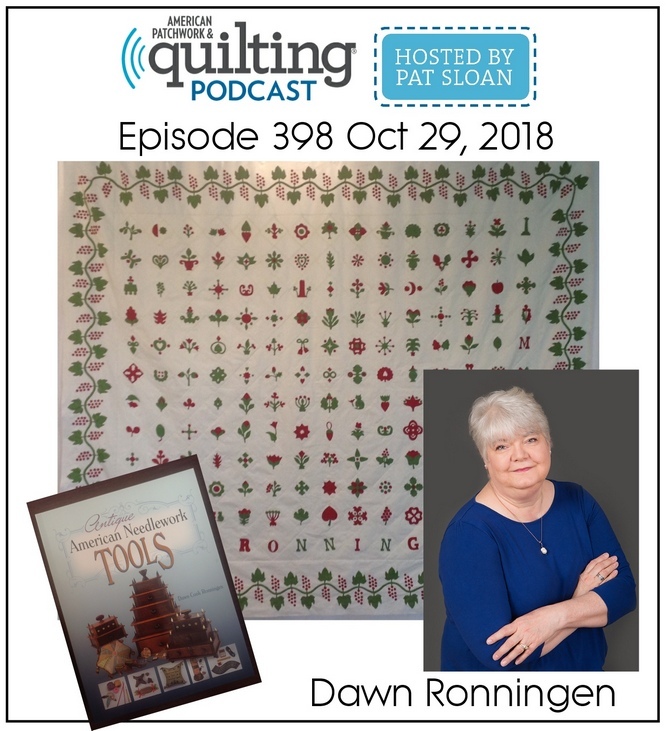 It will never be in a show, even though she did fantastic quilting. Note the black border at the top - the only black border on the quilt. No border at the bottom, just indigo triangles. The right side has yet another size inset wedge. The left side is another smaller inset piece. No side the same, another endearing feature. Great progress to report on The Graduation Quilt. All of the outline quilting and some detail is complete in the blocks. Two sides of the setting blocks (the navy dot) are quilted. Once I finish hand quilting the setting edges I will bind it. 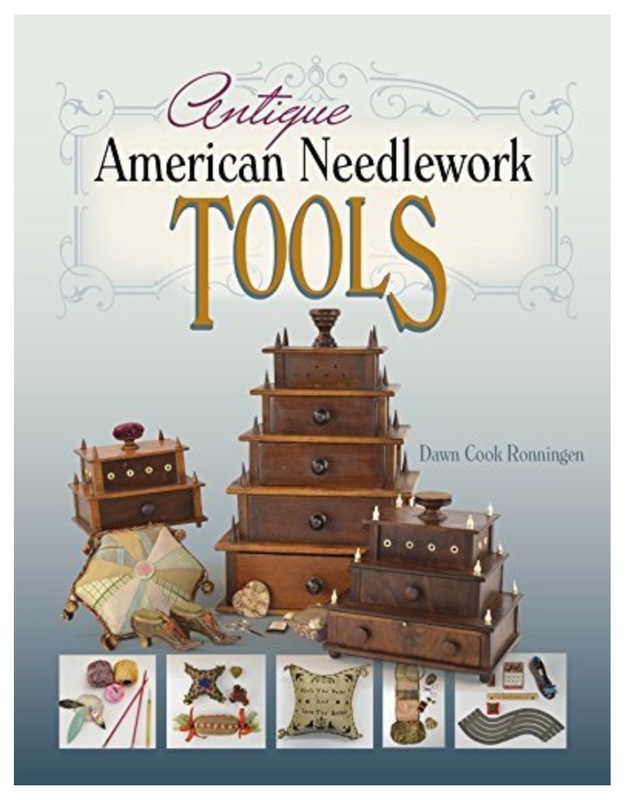 If needed, I could gift it then, but am hoping all of the filler quilting can also be finished before gifting. Month Six of the Catherine's Garden BOM is posted HERE. The borders have small stems for each leaf. As a back baster, my marking is always on the BACK. For the stems I mark them on the FRONT. Using a 3/4" wide bias strip, I machine stitch it on the outer curve of the line. I trim the seam allowance to reduce the bulk when folding the stem fabric over. With 32+ little stem pieces to do, this process goes fairly fast. I hide my knot in the seam - no knots show on the front or back. Needle turn down the length of the stem. If only the leaves went down as fast as the stems! We put the border patterns out in the middle of the year so you can work on them over a few months. Anyway, that's my preference! The finished stem has two nice smooth edges. It is difficult to tell if the edges are machine or hand sewn. I know there are many successful ways to do vines and stems. No one right way. This is my preferred way to do my little stems. The way you prefer is the right way! Enjoy your stitching and have a great week! A little confusion on the Virginia Road Trip - I am flying not driving! Air Trip just doesn't have the same ring to it as Road Trip.